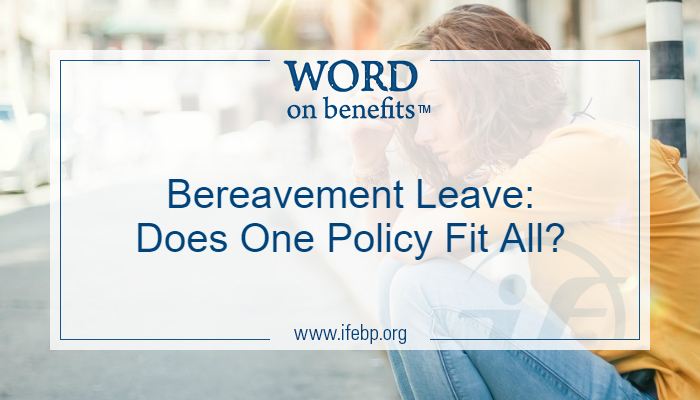 Bereavement Leave: Does One Policy Fit All? 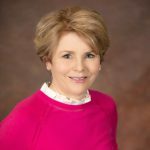 Bereavement Leave: Does One Policy Fit All? The loss of a loved one may force workers and employers to blend their personal and professional lives which can be sticky for all involved. Even though your organization likely has a detailed, written bereavement leave policy that provides a specific number of days of paid leave, can all situations be considered the same? According to the International Foundation Paid Leave in the Workplace: 2017 Survey Results, 94.2% of all responding corporate and public employee organizations provide some type of paid bereavement leave, either through a separate bereavement leave policy or a paid-time off (PTO) program for their workers. 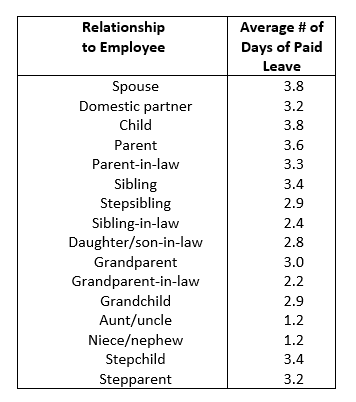 Although most employers offer at least some type of paid bereavement leave, the number of paid days away from the office varies greatly among organizations and is dependent on the employee’s relationship to the deceased. Policies may not address whether the deceased was a parent to young children or other circumstances which may affect your worker. Facebook announced earlier this year, followed by Mastercard, Inc. that they were doubling the amount of time their employees receive for bereavement leave to 20 days following the death of an immediate family member and up to 10 days for an extended family member. Sheryl Sandberg, Facebook’s Chief Operating Officer, who lost her husband suddenly in 2015, leaving her with two young children while working as a technology executive, has first-hand experience juggling work and family during a profound loss. More than four in ten (41%) respondents to the International Foundation survey indicated that, in the case of the death of a spouse, domestic partner or child, they would offer access to additional paid or unpaid leave (other than vacation) beyond what is offered under their bereavement policies. Several organizations wrote in responses indicating they allow workers to use sick time, personal leave, unpaid leave and donated leave. Other organizations suggested they would grant additional time off on a case-by-case basis, acknowledging the importance of allowing their employees the time to grieve. Workers often request bereavement leave at a time of emotional distress. Pairing a well-designed policy with a supportive, caring, solutions-oriented discussion may result in a bereavement policy fit for all.